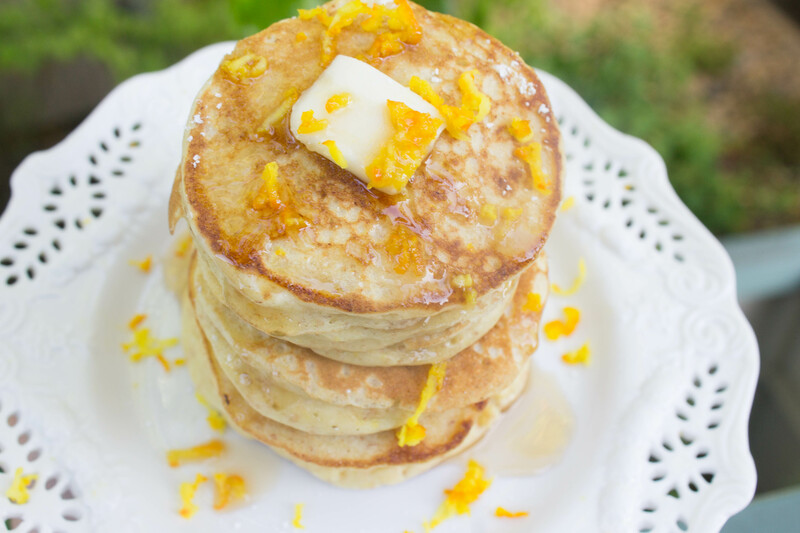 Pancakes are a breakfast favorite of mine, because who doesn’t like a tall stack of em’? 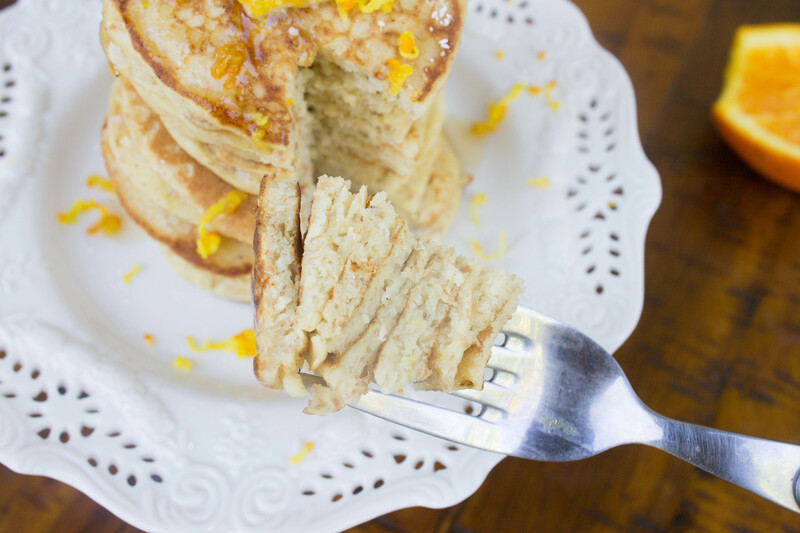 These pancakes are fluffy and have a hint of orange in them. The ricotta adds a touch of creaminess to these! You can even freeze these in the freezer and pop them out when you want to have a delicious quick breakfast by popping them into the toaster! 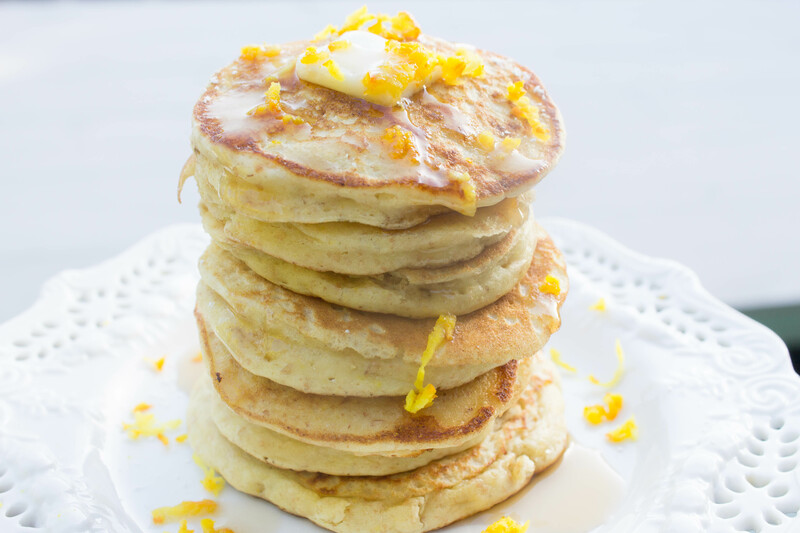 These fluffy, zesty, and sweet pancakes are bursting with a delicate orange flavor and are perfect when topped with warm maple syrup and melted butter! In medium bowl, whisk together the flour, sugar, baking powder, baking soda, and salt. In a small bowl, whisk together the egg, ricotta cheese, milk, orange juice, butter, and orange zest; set aside. Make a well in center of the dry ingredients; pour in milk mixture and whisk very gently until just combined (a few lumps should remain). Do not over mix. Heat a 12-inch nonstick frying pan/skillet over medium heat for 3 to 5 minutes; add 1 teaspoon oil or butter and brush on skillet evenly. Pour 1/4 cup batter onto 3 spots on frying pan/skillet. Let pancakes cook until large bubbles begin to appear, about 1 1/2 to 2 minutes. Using a spatula, flip pancakes and cook until golden brown on second side, 1 to 1 1/2 minutes longer. Serve immediately, and repeat with remaining batter. Top with more orange zest, a pat of butter, and drizzle of maple syrup. Enjoy! I feel like it’s not enough dry to wet ingredients. I made these with the 1/2 c whole wheat flour and they spread more like crepes. So I added an additional 1/2 c of flour and they were a bit better but could use a bit more flour. Did you mean 1 1/2 c flour? Otherwise, these were delicious! I have updated the recipe!